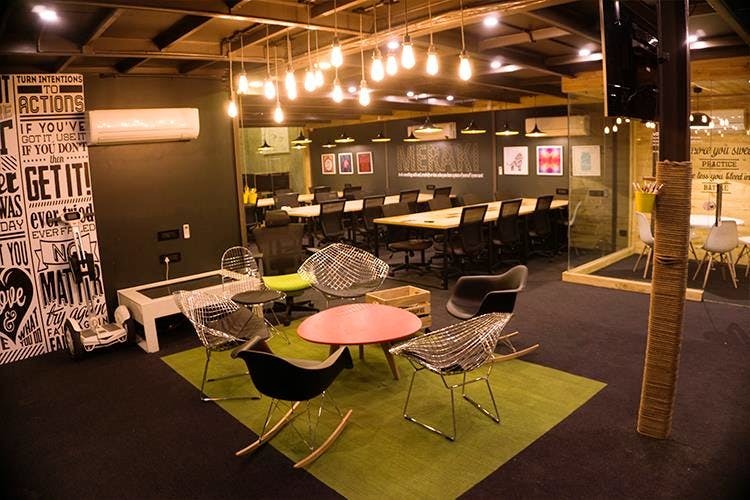 Delhi’s newest co-working space, Innov8, has opened its doors in the heart of the city, Connaught Place. Founded by a group of entrepreneurs and investors, Innov8 provides a great space for young start-ups and innovators. The team behind the co-working space believe their previous experience in nurturing start-ups will bring much value to their clientele. Innov8 itself is large and spacious, with around 8,000 sq. ft. of prime space in the famed Regal Building. The aim of the team is to promote innovation and creativity among their users. They even regularly host events, like talks and workshops, for upcoming entrepreneurs and ideators. Targeting a young audience, the Innov8 space is vibrant, funky and fresh. The popular deconstructed industrial modern look is in use here, with smooth wood finish communal tables, low-hanging light bulbs, and graffiti sprayed across various walls. You can expect high-speed connectivity across the whole area, pinewood enclosed private meeting rooms, strategic mentorship from the founders, a recreation space to relax and unwind, a terrace to come up for some fresh air and a customised workspace for each team, or individual. The beautifully crafted new workspace is here to stay and you can be sure, by the looks of it, the capacity will be full most of the time. If you’re still not convinced you can take a virtual tour of the space here. If you’re looking for a co-working space elsewhere, we have a few ideas. Price: INR 600 for a day pass. Find all pricing here. Find out more here. Follow them on Facebook here.